Hugh Marriage was a trustee of the Hastings and St Leonards Foreshore Charitable Trust (Registered Charity 1105649) for five years from 2006 to 2011, and chaired the Board of Trustees for much of this time. During this period the main work of the Trustees was to recover over a million pounds lost as the result of charity abuse, re-structure the charity so that Hastings Borough Council could again become the trustee, appoint the UK’s first charity Protector, build a multi-sports area on the foreshore and clear the way for the Jerwood Gallery to come to Hastings, partly on Foreshore Trust land. A brief history of the Trust is below. The beach had not always belonged to the Crown. It was originally given to the Church of All Saints in Hastings by Janneta Clyve (or Clyffe) in return for an “obit” – the saying of prayers for her soul. But obits were banned as superstitious and a 1461 statute of Edward IV required land given for superstitious purposes to be forfeit to the Crown. Some time before 1827 a portion of shingly land to the west of the Priory Water, beyond the parish of St. Mary-in-the-Castle, which had once been covered by the sea, was occupied by smugglers and other adventurers, who built several tenements on it. They hoisted an American flag, called the place America and “behaved in a lawless manner”. After public criticism of the Corporation for inaction, they were eventually ejected. This event is commemorated each year as part of the Hastings bonfire celebrations. Not long after, work was started to create St Leonards, and the builders blew up and destroyed a large rock known as White Rock and replaced it with a sea wall and a road. In about 1869, a company was formed to build a pier opposite the old White Rock. For a nominal sum they obtained some land above the high-water mark from the Corporation and, for £100, some land below the high-water mark from the Commissioners of Woods, Forests, and Land Revenues. Around 1888 Hastings Corporation entered into a dispute with the Crown about the extent of the Corporation’s (and the Crown’s) land. The result was that, in 1893, as part of a compromise deal, the Corporation agreed to purchase the beach for £400 “UPON TRUST for the common use benefit and enjoyment of all Her Majesty’s subjects and of the public for the time being for ever”. Further conveyances in 1925, 1933 and 1934 have added to the Trust’s land. The 1893 conveyance appointed the Corporation as the Trustee but did not provide any powers of management of the Trust land – hence the need for the Hastings Borough Council Act 1988 which conferred on Hastings Borough Council, as successor to Hastings Corporation, limited powers to use specified areas of land for public purposes, including car parking, a boat compound, religious and cultural activities and police and emergency services; and to let and develop specified areas of land. The land covered by the 1893 conveyance was between the high and low water marks. The build-up of the beach over the years has resulted in Trust land now including of an area of promenade (with adjacent car parking facilities) which runs along the length of the seafront next to the main road. Following a January 2010 public consultation on the Stade (as required by the Charity Commission, with the Trustees advised by Neasa Coen, who was then with Berwin, Leighton and Paisner LLP), on 15 March 2010 the Trustees obtained an Order from the Charity Commission to enable a land exchange with Hastings Borough Council which was completed on 28 May 2010. The result is that the Trust now owns the whole of Pelham Place car park; and the Jerwood Gallery was able to be built on the land which Hastings Borough Council acquired from the Trust in exchange. The adjacent Trust land was then converted into a high-quality open space. 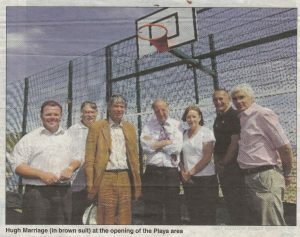 During this time, the Trust was working with Hastings Old Town Residents Association (HOTRA) to create a multi-games area on the Stade, close to Arnold Palmer Putting. The Pelham Playa was named and opened formally on 14 October 2010. In 2007 the Charity Commission proposed a new Scheme to transfer the trusteeship back to Hastings Borough Council. At the Charity Commission’s request, in May 2009 and as a pre-requisite for the new Scheme, the trustees selected a Protector for the Trust, Christopher May. The Commission launched a public consultation in December 2009: this finished on 12 January 2010. The Commission’s proposed Scheme contained the safeguards of a Protector; an annual public meeting; and public documents on the governance of the charity. At the end of March 2010 the Commission asked the trustees for a financial appraisal of the proposal and some alternative options. A report prepared by the Trust’s financial adviser, James Aston of BDO LLP, was sent to the Commission on 27 May 2010. Broadly this said that the Trust would continue to make a substantial surplus for charitable activities in Hastings if the trusteeship were returned to the Council; but, because of the additional overheads involved, would probably operate at a loss if the Trust remained independent of the Council. On 20 July 2010, Amber Rudd, MP for Hastings and Rye, put down a Parliamentary Question to the Chair of the Charity Commission about the consultation, for answer by 27 July. On 26 July the Charity Commission wrote to the Trust’s legal advisers saying that they proposed to make the new scheme as drafted, with some additional safeguards. The trustees welcomed this. The independent trustees’ last meeting was held on 12 January 2011 in Hastings. On 13 January 2011 the Charity Commission sealed the Scheme to make Hastings Borough Council the trustee in all respects, and appoint the Protector. The inaugural meeting of Hastings Borough Council’s Charity Committee was held on 25 January 2011 with the Protector present. The governing documents of the Trust are: the conveyance of 8 September 1893 between Her Majesty Queen Victoria, Sir Robert Nigel Fitzhardinge Kingscote, the Board of Trade and Hastings Corporation; the Hastings Borough Council Act 1988; from 2006-2011, a Scheme of the Charity Commission dated 22 March 2006 which amended certain provisions of the 1893 Conveyance and, in particular, appointed trustees to act in place of Hastings Borough Council and made the Trust a registered charity; and, now, a Scheme of the Charity Commissioners dated 13 January 2011. It is important to note that the charity was created by the 1893 Conveyance so has therefore been in existence since that time.